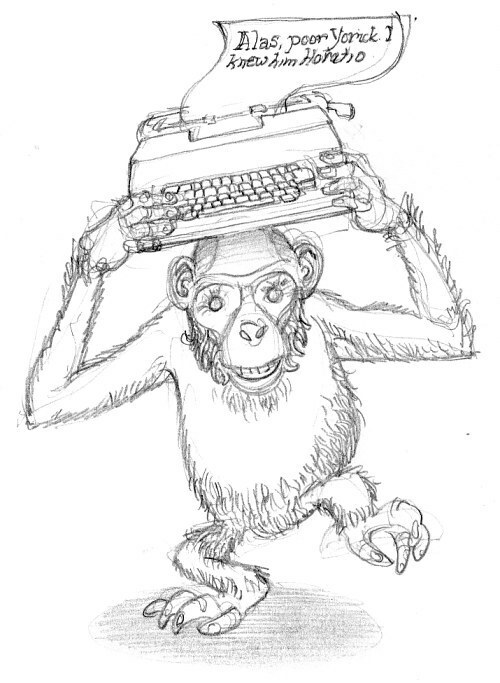 Given an infinite amount of time and a typewriter, a monkey will eventually type the works of William Shakespeare. Given an infinite amount of time and a stone, a monkey will eventually throw the stone faster than the speed of light. Now, that’s just stupid. And so it is, but it exposes the monkey in the experiment. These types of games have a habit of ignoring limits. The monkey never gets bored and quits. The monkey never gets sucked up in a tornado. The monkey doesn’t starve to death. The sun doesn’t red giant and consume the earth. If an intelligent designer sets the limits of the experiment in order that a monkey on a typewriter can produce the works of William Shakespeare, then a monkey on a typewriter can produce the works of William Shakespeare. A statement that logically conforms to this type of premise is unarguable, but also completely useless. In this case it is worse than useless, because the point of this thought experiment was to exclude intelligent design from perceived order. Order is derived from the perception of the viewer. This is what makes the vantage point of truth so powerful. We are quick enough to say that God is infinite. Yet, because infinity breeds complexity, at the same time we scramble around to try and make him as simple as possible, because we don’t want to see him as random. Ask someone to envision infinity, and it is likely they will see it as a line or a string, not as a matrix in three, or more, dimensions. Arguments both for and against God make this kind of mistake, but perhaps there will be more on this next post.